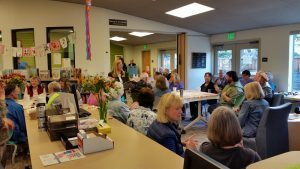 Our fantastic Morro Bay Library Staff hosted their Annual Volunteer Recognition Celebration on April 27th with many of our wonderful Library volunteers enjoying a fabulous array of goodies. Two incredible Volunteers of the Year were honored with their names engraved on the Volunteer of the Year Plaque, along with special gifts. Former MBFOL Treasurer, Gerry Fuller, off on a well-deserved vacation in Panama, was lauded for her amazing bookkeeping prowess getting us through the remodel process, along with her much appreciated patience and sense of humor. Thanks to all for a great celebration and for everything you do! 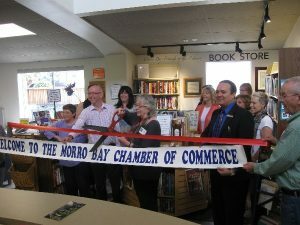 The Book Store inside the Morro Bay Library has become a member of the Chamber of Commerce. Thanks to all of the wonderful donations from our community, the bookshop inside the library has become a great sponsor of the various programs available at the library. 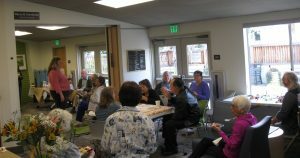 On Thursday April 14th the staff of the Morro Bay Library hosted a volunteer breakfast to honor all the wonderful volunteers that help make our library great! Susan Gossard, MBFOL’s Vice President, was honored with the Volunteer of the Year Award.